Xanthan Gum Market size will exceed USD 740 million in 2015, at an estimated CAGR of 6% from 2016 to 2023. Change in consumer lifestyle in Brazil, Russia, India and China has increased convenience food demand which may propel global xanthan gum market growth. Also, expanding demand for naturally sourced emulsifiers in confectionery and bakery products may stimulate market growth demand. In addition, it is also utilized as a substitute to salivation for dry mouth which may support this market. Growth in end user industries include oil & gas, food & beverages, cosmetics along with pharmaceuticals, is boosting demand for xanthan gum market. Global food & beverage industry surpassed USD 15 billion in 2015 and should grow at more than 5% during the forecast timeframe. New product launches by major food processing companies will drive product demand. The oil and gas industry utilizes it as an additive in oilfield drilling mud, it is also suitable for tertiary and enhanced oil recovery. Growing expenditure for exploration, recovery and manufacturing of crude oil and natural gas has played a vital role in growing xanthan gum market demand. Increasing cosmetic industry is also anticipated to escalate xanthan gum demand. Due to its physical properties, it is utilized as a part of manufacturing various beautifying agents. In cosmetics industry, product is utilized as settling and thickening specialist in restorative products, for example, cleaners, denture, moisturizers and shampoos. Rising significance for natural beautifying products with expanding awareness towards dangers related with synthetic individual care products is probably going to support global xanthan gum market demand. Cosmetic industry generated over USD 140 billion in 2014, and should surpass USD 600 billion by 2020, with estimated gains at over 6%. Growing ageing population globally along with increasing concerns for personal health and hygiene in Asian countries, enhances industry growth. Positive indicators from regulatory bodies such as USDA and FDA for usage of xanthan gum in bakery products & medicines should drive the market growth. It faces potential threat from Gaur gum, a galactose and mannose combined polysaccharide, and holds characteristics like strong viscosity and solubility. India was major gaur gum manufacturer in 2015 globally, owing to abundant availability of guar seeds in western and northern states like Haryana, Rajasthan and Gujrat. 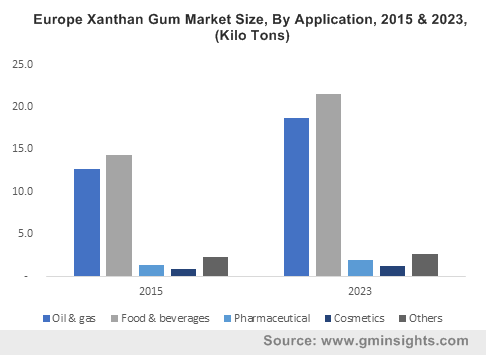 Increasing usage of guar gum in F&B sector and natural gas may hinder demand and show strong impact on xanthan gum market price trend. Food & beverage applications is projected to witness gains at over 6%. Uses include retaining moisture and prevents staling, which results in increased shelf lifespan of baked goods. It is used in bakery products, provides easy pourability, binds water and improves texture. Furthermore, it is used in frozen food as it offers better freeze stability, stabilizes emulsions and improves texture. Xanthan gum market size from oil & gas generated over USD 300 million business in 2015. It minimizes pumping friction in saltwater and saltwater muds. It maximizes the drill bit penetration and accelerates drilling rates in low thickness or high shear conditions. Additionally, use of xanthan gum drilling oil leads to reduced cost of operation along with low maintenance of machinery. Strong refinery output indicators may positively impact industry growth demand. Pharmaceutical application should exceed USD 50 million, with over 5% growth. It is utilized in drug manufacturing as stabilizer to prevent ingredient from separating. In solid dosage formulation, it acts as a controlled release agent and in liquid formulation as thickening, stabilizing and suspending agent. Other applications with xanthan gum market share include animal feed as liquid milk replacer and in pet food. In personal care industry, it is used in toothpaste, creams lotions and shampoos. It provides easy pumpability and excellent flow properties. North America was more than USD 220 million for 2015. U.S. xanthan gum market size for pharma applications accounted for over 30% of the global share in 2015. Growing ageing population along with high rates of chronic illnesses and drug consumption should drive regional growth. Europe, driven by Germany and UK xanthan gum market, expects gains at over 5%. Growing personal care products in major European markets including Italy, France and UK may boost industry growth. In addition, increased R&D activities in pharmacological industry may fuel product demand in this region. Asia Pacific, dominated by India and China xanthan gum market size is poised to exceed USD 490 million by end of 2023. Strong outlook in skin care and pharmaceutical industry in Asian countries owing to increased local demand along with low production cost may drive industry growth. Global xanthan gum market share remains concentrated with combination of domestic well as international players. Key market players include Cargill, ADM, Solvay, Dupont, and Pfizer. Companies are focusing and adopting different distribution channel for product selling. Common components of distribution include wholesaler, traders and jobbers. These manufacturers focus on eliminating the middleman costs by adopting direct selling strategy. Other prominent companies include CP Kelco, Fufeng Group Company Limited, Deosen Biocheical, Kantilal Brothers, Sancho & Lee, and Qingdao Unichem. Xanthan gum is also known by other names such corn sugar gum or bacterial polysaccharide. It is produced by fermentation of bacterium called Xanthomonas campestris along with corn sugar. Consumption shows a few adverse effects on human body. It swells in the intestine and stimulates the gastrointestinal tract. It also lowers sugar absorption speed in the digestive system and acts like saliva and helps in lubricating the mouth of patients suffering from Sjogren’s syndrome.